Michael Schumacher took pole position at Monza, an amazing feat given the poor performance of the Ferrari team at Hockenheim a few weeks earlier. This was put down to better Goodyear tyres. There had been a lot of rain during the practice days which meant that everyone was struggling with set-up during the qualifying session. McLaren found that it had the wrong gear ratios and that the Bridgestone tyres were not working well and this meant that Mika Hakkinen and David Coulthard were third and fourth on the grid behind Schumacher and Jacques Villeneuve, who once again found that the Williams was very good in high-speed corners. Eddie Irvine was fifth and Ralf Schumacher sixth in his Jordan. On the day of the race Schumacher made a poor start and was overtaken by both McLarens, Irvine and Villeneuve. Hakkinen had barged Jacques out of the way and this meant that the Williams was behind Coulthard and Irvine as well. Jacques was pushed back to fifth later on the first lap as Schumacher began to charge. On the second lap Irvine let Schumacher up to third. The McLarens had built a lead of four seconds but suddenly on lap eight Coulthard went ahead and Hakkinen began to drop backwards towards Schumacher. Further back Damon Hill, who had qualified fourteenth on the grid, was able to charge up to fifth place in the course of the first 14 laps having decided on a light fuel load. Coulthard quickly built a lead of 10secs over Hakkinen but on lap 17 David's engine suddenly blew up. Hakkinen and Schumacher arrived at the second chicane in a cloud of oil smoke and both had to slow down. There was a scramble to get back onto the power and Schumacher managed to get ahead. Once in the lead Michael stayed ahead while Hakkinen faded badly at the end of his first stint. All the leading cars except Hill were on one-stop strategies and, with Schumacher able to stay ahead, there was little hope for Hakkinen to retake the lead. Mika charged hard but then made a mistake and spun. He rejoined but was in trouble with his brakes. Irvine and Ralf Schumacher were both able to pass him before the finish. Villeneuve's race had by then ended with a mistake at the Lesmo Corner. 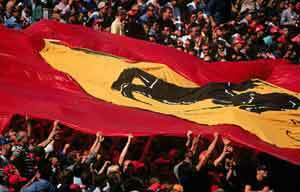 Ferrari fans celebrated the team's first 1-2 finish at Monza for 10 years and Schumacher left knowing that with two races to go he was equal on points to Hakkinen. The World Championship could go either way.